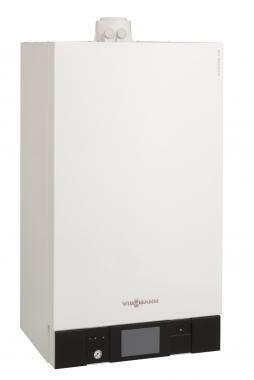 The Viessmann Vitodens 200-W system boiler is designed for properties that use a separate cylinder to store hot a ready supply of hot water. This version offers 30kW of power and should provide enough hot water for a four bedroom house with two bathrooms but the range has enough power options to suit most properties. The Vitodens 200-W is heavier than similar boilers at 47kg and is too big to fit behind a standard kitchen cupboard (it measures 85x45x36cm) and requires 70cm clearance at the front for servicing. This boiler comes with a number of control options and you can opt for a constant temperature controller (Vitotronic 100) or a weather-compensated controller (Vitotronic 200 both come with a 7 day timer. External control should be considered to maximise your boilers efficiency your installer will advise on what options are best for your property. This boiler comes with a standard 5 year warranty as long as it is fitted by a Viessmann approved installer. All Viessmann boilers are recommended by the Energy Savings Trust.